The Realm plane is the first, starting plane where all adventures begin. 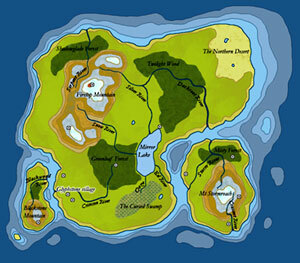 With the exception of a few select locations, this realm does not allow combat between players. The plane consists of three islands, and the only friendly settlement is the Glyphstone village, in the southwestern part of the main island. Monster lairs hiding magical treasure can be found throughout all three islands, but newcomers are encouraged to do some training at the village before exploring them.